I’m happy to present the first review not related to ostomy products on the VeganOstomy site! I hope that this review will appeal to everyone, including ostomates and people with IBD. So without further ado, let’s get started! I was contacted by Kiss Me Organics to see if I’d be interested in reviewing their Organic Matcha. Being a tea drinker, I was curious to see what their product was like, so I agreed. Matcha, for those who aren’t familiar, is green tea powder. We already know that green tea is good for us and it provides an abundance of antioxidants, so it’s no wonder that matcha has become popular with those looking to improve their health. The package claims that this product will provide “all day energy”, “increased focus”, “improve skin health” and other benefits. Being a skeptic, I asked Kiss My Organics to give evidence which substantiated these claims, and they were kind enough to send me some information about it, which you can read in the links at the end of this review. For this review, however, I’ll be only focusing on the quality of the product and not the claims made about it. You can do your own research about green tea and matcha if you like, and I think you’ll find quite a bit of evidence which supports green tea consumption. This product is sold exclusively through Amazon, which is a good thing, because not only does this product qualify for free shipping, but Amazon is known for their speedy delivery too. In no time, I received the matcha and was ready to drink up! The packaging is nice, and it’s resealable too, which is great. It did come with an extra plastic bag around it, which I thought was redundant and just added to plastic waste, which I try to cut down on as much as I can. This product comes in one size at the time of this writing, and you get 4oz (113g) worth, which should last about six weeks. Each “daily dose” is 1/2 – 1 teaspoon. If you’re a heavy tea drinker or use it in other recipes, you’ll likely consume much more. usually enjoy tea. The one exception was with the Sparkling Matcha recipe, which included carbonated water and lime. It was quite refreshing. Traditional matcha preparation often involves sifting the matcha, making a paste and whisking it with a special bamboo whisk. I didn’t find the need to have to do all that to enjoy this product. I would simply add the amount I wanted (usually 1/2 tsp) to a cup and then added some warm water first. I’d then mix it up to form a paste, which means you won’t see any clumps in the tea, and then added very hot (not boiling) water and gently stirred until it became a bit foamy. The flavor of this product without adding any sweetener was quite pleasant and reminded me of wheatgrass juice (likely because of the high chlorophyll content) or a stronger green tea (which is technically is), but it can also depend on how you prepare it and how much of it you use. One very interesting point I wanted to make was that the matcha seems to be very high quality. I had another brand of matcha already in my fridge, so I was able to compare both and the visual difference was quite obvious. But looks aren’t what matters, what about taste? I did a rather unscientific taste test between the Kiss Me Organics matcha and the other brand (a premium matcha label) and both my daughter and I tasted each, followed by some water to cleans our pallet between sips. WHAT A DIFFERENCE between the two teas! The Kiss Me Organics tea was full of flavor and the other brand, as my daughter put it, “just tastes like warm water”. This was with an equal serving size of one teaspoon in 3/4 cup of water (approx. 175ml or 6oz). The Kiss Me Organics Matcha is USDA certified and tested well below the standards for heavy metals in food. The owners of the company have assured me that they are diligent in making sure their suppliers provide the purest green tea possible and have samples tested on a regular basis. Because tea (especially green tea) contains tannins, which can reduce iron absorption, be cautious when drinking too much if you have anemia or are taking any medications known to interfere with iron absorption. You can find some tips on how to increase iron absorption HERE, but if you do drink tea, take your iron supplements and meals separately. At the time of this writing (May 7 2014), you can find the Kiss Me Organics Matcha on sale at Amazon.ca for CDN($29.99) or Amazon.com for US$25. The regular price is CDN$39.99. Some people love coffee, and others love tea. If you enjoy tea, especially green tea, then you’ll want to try matcha. Not only does it provide more antioxidants than regular green tea, but it can be used in more than just hot drinks. For more information about this product, please visit www.kissmeorganics.com or order directly from Amazon (this is NOT an affiliate link). Do you drink matcha? Share your favorite way of enjoying in the comments. How do you know what the heavy metal levels are? 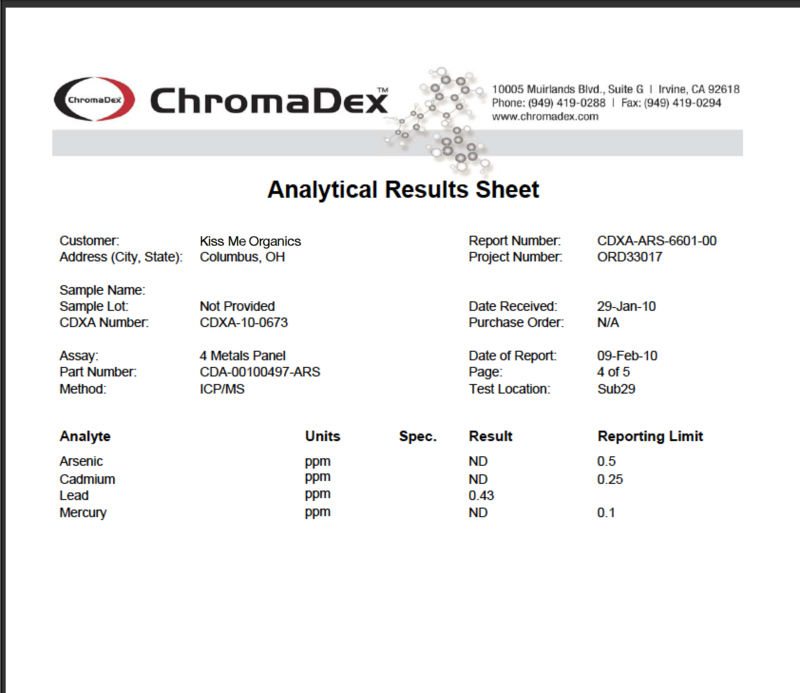 I can’t find anything on their website or packaging that says kiss me organics tests for metal levels? I mailed them for proof :) Here’s a copy of what they sent, but I do have quite a long email with other links from Kiss Me Organics. We LOVE tea!! I think we’ll be trying this. Thanks for the suggestions and pictures. Great review.